Let’s pause for a second to recognize the fact that I have never been a girl who was totally up to date on beauty trends nor have I ever been one to spend a lot of money on things. It was years before I ever stepped foot into a Sephora and that was only because I was given a gift card. Shocking I know. I should also clarify that this post isn’t about saying these things should never be done or that if you’re doing them that you’re living life wrong. Um no. I believe in being healthy and taking care of your body, but sometimes a girl just has to feel pretty and get pampered some. 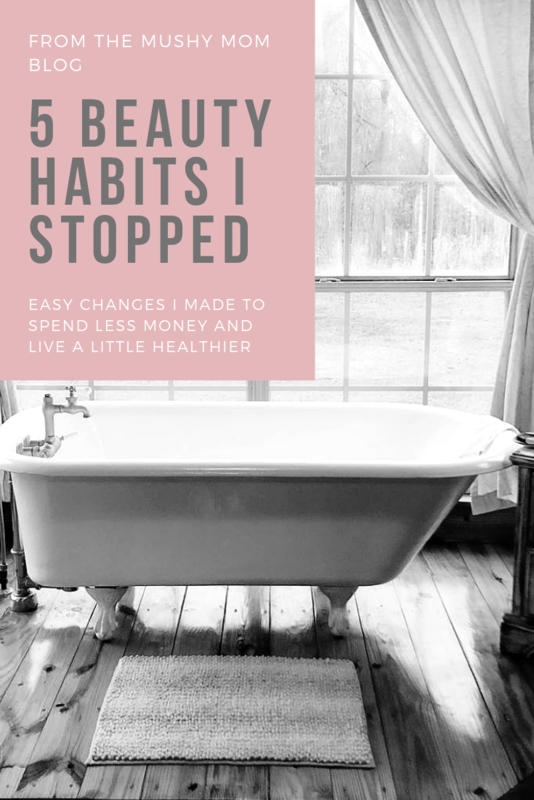 What this post is about is becoming not only knowledgable about beauty and skin health, but becoming comfortable in your own skin and in your own decisions. I decided long ago that I wasn’t going to be one investing money in all of the extras just for my appearance but that is strictly a personal decision and it doesn’t mean it’s right or wrong. So with that being said, what are some of the typical things that most women do that I simply DON’T do anymore? You’re probably thinking some crazy, hippie things like no deodorant or no shave November, but nah — I still like to be fresh and clean. And while I’m not high maintenance, I do enjoy to look nice and put together. However when it comes to my health, I refuse to saturate my skin with too much stuff that is damaging over time. Sure on occasions I get my nails done or receive a facial, but I am not one to load down my skin with too many things. Not to mention that having children makes you check your priorities some as certain things become costly over time. Having a vice isn’t a bad thing, but sometimes kicking your old vice and getting new ones can benefit your health and your wallet over time! Dying My Hair. This started for a multitude of reasons really. I was a boxed hair dye kind of girl who had a new hair color every few months. I was tired of the upkeep, the money and the damage being done and once I was getting ready to have children, I knew that I wasn’t going to keep that up. Before I was truly a “natural minded mama,” I decided to get my hair professionally dyed back to my natural color and was done. It still had somewhat of an awkward growing out stage, but it has now been since 2012 that my hair has been colored and I don’t regret it one bit. For me it’s not so much about dyes being toxic, but also about the upkeep and money. I don’t mind my hair color and I love how easy the upkeep is now! At the end of the day though, it feels good to not come into contact with those chemicals in anymore. Perfume. Oh this was hard! Every year at Christmas I was gifted perfume from some of the top names and brands. It was little treats I was given that felt so pampering. But as time went on and I learned more about artificial fragrances, I realized how toxic those were. Suddenly I didn’t want to be nursing my baby while covered in Ed Hardy or Dolce and Gabana. I wanted my skin to be clean and healthy and honestly, I just quit perfumes until essential oils came into my life. Now all I use daily is essential oils for my perfumes! My favorite oils for perfume are Joy, Envision, Peace and Calming, Valor, Tranquil and White Angelica. See our oily section for more information! Shaving Cream. By now you’re probably thinking I’m crazy, but hear me out. I am not one with sensitive legs and shaving cream never made much difference to me. Finding a natural cream that isn’t loaded with toxic ingredients is hard and you know, a god soap lather works just fine for me! This may not always work for some, but if you’re like me…then save your $3 and skip the shaving cream. Cheap Makeup. There are so many brands of makeup all over and to be honest, I was always a cheaper makeup kind of girl. I never saw anything wrong the quality of my CoverGirl or L’Oreal. However over time I have learned the facts about the American cosmetic industry and that has led to my decision to invest in healthier, higher quality makeup. In the European Union there are over 1400 cosmetic ingredients banned and in America ONLY 30 of those ingredients are banned. Our cosmetic industry is quite disgusting to be honest and cosmetics are full of cancer causing, fertility disrupting ingredients. After learning about this, I slowly began researching and making changes in my makeup and finally settled on this brand to that is completely non toxic and natural. While natural makeup may not be for everyone, I do believe that higher quality makeup is likely healthier in the long run, but I encourage you to research the brand and ingredients within your makeup. The average woman puts 300 chemical ingredients on her body daily and so much of that is coming from our makeup. Being aware helps us become informed! Beauty shouldn’t be a compromise. You shouldn’t have to pay the price of using chemical filled, expensive products just to feel beautiful. Would I love to be tanner sometimes? Yep. Do I occasionally want some fun color hair? Sometimes. But then I remind myself that this is how HE envisioned me, and I’ll just stay this way so I can be my healthiest, happiest self. We all have different wants and needs, vices and concerns…but sometimes we don’t always realize there IS an alternative.